5 out of 5 StarsWhen September, a young girl from Omaha, is offered a chance to take a ride on a flying leopard, she finds herself in Fairyland. But all is not well as the strict Marquess has been imposing rules upon the colorful inhabitants. 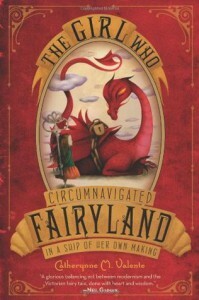 As September tries to complete a quest to recover a spoon, she doesn’t only change herself, but Fairyland as well.The Girl Who Circumnavigated Fairyland in a Ship of Her Own Making has the whimsical and witty tone reminiscent of Lewis Carroll and other Victorian children’s authors. However, Fairyland is more contemporary, heartbreaking, and self-aware than Alice in Wonderland, and September is much more willful and worldly than Carroll’s protagonist. She is a clever, fearless, and resourceful heroine, yet she doesn’t seem to fall straight out of the “middle-grade heroine” mold. 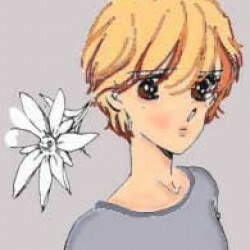 She makes mistakes, makes sacrifices, and has to do (in her childish brain) some terrible things. September doesn’t become an adult – she still maintains her childlike understanding of the world – but she does grow.Of course, this type of quest story hinges on the success of its colorful secondary characters, and this is where Valente shines. September meets a wyverary (the love child of a wyvern and a library, whose knowledge only goes to the letter L), glashtyn (hideous creatures with horse-heads), and many other unique creatures. To reveal too many characters would spoil things and it’s always a delight to see what Valente comes up with next. Valente also includes many helpful female side characters because all too often, side characters in children’s stories tend to be solely male (Disney, anyone?). Valente manipulates her voice to mimic these classics, but cleverly brings real world adult insights to characters and inanimate objects, so that September is very much navigating the ridiculous rules of adulthood as well as the strange landscape of Fairyland. Fairyland has shades of our own world, as September is forced to understand absentee parents, war, slavery, homesickness, etc. This is a book that can be enjoyed by an adult as much as a child, and possibly only fully understood by an adult. While a child may be caught up in the magic of the story and its characters, an adult can understand the meaning behind the silly sayings and friends September meets.This review would be incomplete without mentioning the fantastic illustrations by Ana Juan that begin each chapter. She helps bring the characters and the world of Fairyland to life. Her illustrations are the perfect blend of expressive and abstract, a wonderful compliment to Valente’s writing.While a mouthful of a title (but isn’t that a bit of its charm? ), The Girl Who Circumnavigated Fairyland in a Ship of Her Own Making is one of those books that will enchant young and old alike. It harkens back to previous children’s classics, but gives its own modern twist. Valente has created a world that, like September, readers will want to visit again and again (and of course, we can because she has written at least two other Fairyland books :D).